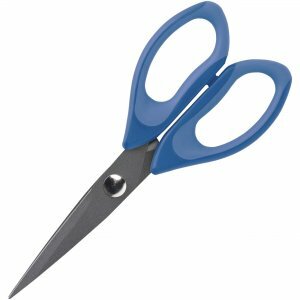 8" scissors feature a nonstick, permanent coating that resists adhesives from tapes and glues. Use these scissors to cut tape, hook-and-loop fasteners or other adhesives. Pointed blades are made of a durable stainless steel to deliver precise cuts. Straight handles are made with plastic along the exterior perimeter and rubber along the interior grip for minimal fatigue during use.